Whether you take your espresso as an austere, unadorned shot or a sweet and frothy coffee bar confection, going back to ordinary drip coffee can be a sad letdown. If buying a true espresso machine is out of the question for practical reasons, you might wonder whether it's possible to replicate your favorite drinks with an ordinary coffee pot. Sadly your regular pot isn't capable of making espresso, but it is possible to make coffee that is somewhat espresso-like. True espresso coffee is made quickly by forcing hot water though tightly packed grounds at a pressure of 9 "atmospheres," or 130 pounds per square inch. 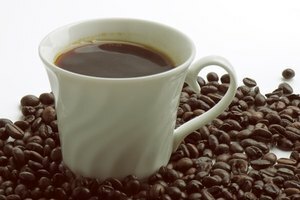 In contrast, drip coffee infuses at normal air pressure, or 1 atmosphere. To make your drip coffee as espresso-like as possible, keep the infusion brief. First, pour in just enough hot water to moisten the grounds. Let them rest for roughly 30 seconds, so the moisture can penetrate the grounds, then pour in more water. Remove the filter from your mug as soon as 2 ounces of drip coffee have accumulated. They'll be heavier than espresso, but will provide an intense and bright-flavored base for your favorite beverage. 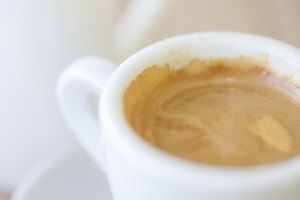 You can create a more espresso-like beverage — though still not a real espresso — by using a home coffee-maker that generates pressure. The Aeropress, a pressurized variation on the pour-over coffee maker, produces a smooth, espresso-like coffee anywhere you can boil water. 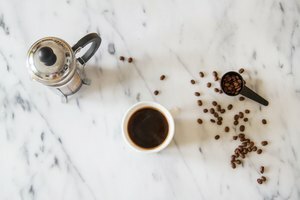 Italian moka pots, often sold as "stovetop espresso makers" in the US, create a richly flavored brew that also works well as a base for your favorite espresso drinks.